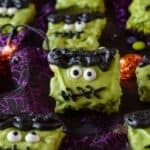 These Frankenstein Halloween Rice Krispie Treats are fun, easy to make, and spookly delicious! Butter or spray with non stick cooking spray a 9x13 baking dish- set aside. In a medium pan over medium low heat melt butter. Add in marshmallows and neon green food coloring. Stir until fully melted. Once fully melted, remove from heat and stir in the puffed rice cereal. After thoroughly mixing, if your mixture isn’t completely green add a little more food gel and stir well. Press the rice crispies into prepared 9x13 baking dish and let cool. Once the rice crispies are cooled and have set up cut them into 24 squares. Line a baking sheet with parchment paper- set aside. Melt the green candy melts in the microwave. Heat for 30 seconds, stir and repeat until candy melts have completely melted. If the mixture is too thick (which I find it to be most of the time) add in 1 tbs of coconut oil, stir thoroughly and test the thickness. If still too thick add more coconut oil, 1 tsp at a time until it is your desired thickness. The candy melts should be fairly smooth and liquidy. Dip one of the broad sides of the rice crispy squares into the green candy melts and set on the parchment lined baking sheet to harden. Right after dipping the rice crispy treats place the eyes on the them. While the candy melts are setting up whip up a half batch up the easy black buttercream (see notes for instructions). 10. Cut the corner off of two ziplock baggies. You want a medium sized hole and a small hole. Fill the bags with the black buttercream and pipe on the scars and hair. * To make black buttercream simply whip up a half batch of my easy buttercream frosting with the following alterations: after adding the heavy whipping cream add in ¼ cup of cocoa powder and several drops of black gel food coloring. You want the buttercream to be a dark grey color. Then let it sett for 10 minutes or so and the color will darken to more of a black. Alternatively, you could buy black frosting from the store and use that.